70 hour soccer game kicks off in Tampa Bay this weekend! Will local Tampa Bay soccer players from Soccer For a Cure kick out the old world record for longest soccer game? We hope so, but if they don’t succeed in that goal they have another more important objective… to raise awareness and funds about a form of cancer, Mesothelioma. Be part of history and help make a difference! The event will be held this Friday, November 9, Saturday, November 10 and Sunday, November 11 at BAYSL Soccer Complex at JC Handley Park in Brandon, FL. The Soccer for a Cure team is trying to beat the current world record where two teams in Canada played soccer for 66 hours. At their second attempt, they are going for a 70 hour soccer game. Three days of kicking the ball around in shifts and giving a second go in hopes that the longest soccer game in history will raise a lasting awareness about this deadly disease. If you are interested in getting involved or would like to donate funds or your time to become a volunteer please visit http://www.facebook.com/SoccerForACure or the official website www.curemeso.org or email soccerforacure12@gmail.com. 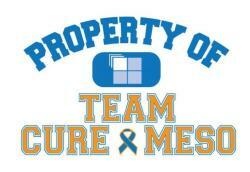 Let’s join together to help break a world record in Tampa Bay and raise awareness of this deadly disease, mesothelioma.